Saturday, May 18-Sunday, May 19, 2002... Greetings from...my apartment, even messier than usual thanks to a week's dirty laundry and accumulated mail scattered about the floor. En route to the University of Chicago campus yesterday morning, I swung by the "first McDonald's" as officially recognized by the chain. It's not. The actual first McDonald's was in San Bernardino, California; the oldest surviving McDonald's is in Downey, California. 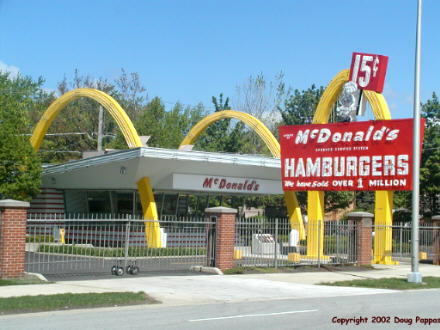 But the McDonald's in Des Plaines, Illinois was the first of the Ray Kroc regime. It's now a museum (though it was closed today), with additional memorabilia displayed at the active restaurant across the street. I reached the campus half an hour early, parking in front of a street sign which proclaimed: "No Parking Dec. 1-Apr 1 or When Snow Is Over 2 Inches." That's an ominous "or." I won't bore you with the memories which flooded back as I walked from my old dorm to the main campus, but they were as happy, poignant, bittersweet, etc. as anything from your own pasts. So there. In the middle of the Quads, teams of students were busily assembling a variety of multicolored activities and stages. About 10 years ago, a national survey of students at 300 colleges and universities had ranked the University of Chicago dead last in terms of a social life, behind even the service academies. Since then the U of C has been on a mission to make campus life more fun -- a mission made more difficult by the type of student the U of C tends to attract. This student accepts the concept of fun, and if given enough advance notice will even schedule time for fun, but won't actually recognize fun unless it's labeled with a large neon sign. The activities planned for the quad seemed to fall into the category of Fun By Committee, to be shunned by all right-thinking people. Our impromptu reunion broke up around 5:00, whereupon I set out for New York. The direct route, I-80, has nothing to recommend it except speed; if feasible, it should be driven entirely at night. With a little more time I would have skipped at least part of the Interstate in favor of either the Lincoln Highway (mostly US 30) or the National Road (US 40), but I didn't want to get in too late. After all, the upcoming holiday weekend means more time on the road! Final totals for this trip: 9-1/2 days, thirteen states, over 5,000 miles driven (I knew there was a reason I usually flew and rented...) and approximately 220 photos. "News from the Road" will return in late August or early September. I'm tentatively planning to tour Atlantic Canada, but other suggestions are welcomed. Keep in touch!